All aspects of the scene are still so vivid: my tiny self, sitting at the dining room table, filling out magazine subscription cards, while mom listened to my many future plans. Was the intent of the cards to burden our mailbox with copies of Redbook and Chatalaine? Hardly. They were blank checks in my imaginary world, each one awaiting my all important and very grown-up signature. Independence has admittedly been an obsession of mine from the outset. I actually begged my dad to build me my own house in the backyard as a kid. I mean, come on. He had his own masonry business. What could be so hard? 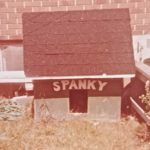 And he’d built a house for our dog, Spanky, with real shingles on the roof and her name across the front. Didn’t I deserve the same consideration? Of course, I understand now why he didn’t, but then? As an alternative, Spanky and I would spend hours together squeezed tight into her little digs. I’d verbalize my vision to her at length as we both kept a watchful eye out for brazen foe (be that stray cats or my menacing brother). I’m reminded of that tiny me quite often when faced with adult challenges, and one thing still remains the same: I love filling things out. In fact, for me saying good-bye to paper checks proved painful, almost like destroying childhood momentos. So sue me for holding tight to my last shred of Leanadom: that old-school transaction record from the bank. That’s right, I’m that person. I loved playing grown-up so much as a kid that I appreciate every nuance of being the real deal today. I particularly like opening mail, because it transports me back to mom’s kitchen table. 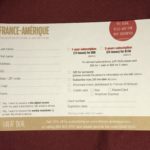 I still tend to stockpile envelopes over several weeks – just like I did those subscription cards, and when I finally get settled in to open them, we’re talking a bonafide event. 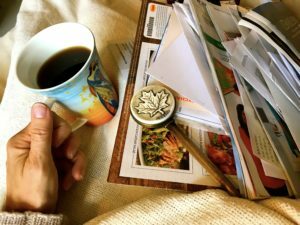 A stack of envelopes, a cup of hot coffee and my ceremonial Canadian letter-opener. I just adore the “schlit” sound it makes slicing through each and every seal, while individual stacks grow higher: one for garbage, one for the shredder, and yes, even a special one for bills. Being an adult rocks, and I don’t take one iota of my freedom and independence for granted. I would even go so far as to say that the older I get, the more I love it. It’s everything I dreamed it would be plus some, and I’m so glad that mom got to see me revel in the experience. I only wish that Spanky had, too. You can take the girl out of the doghouse, but . . . Previous MY NEW FAVORITE QUOTE! I just love it me friend….I can even picture you side by side with your dog in that lovely little dog house! !